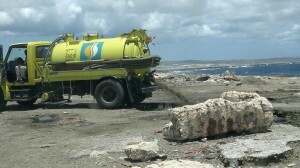 WILLEMSTAD - Over 80 percent of sewage water still ends up in the sea. This is according to Timo Brouwer of the environmental organization GreenForce. Brouwer was present last week during a public meeting of the United Nations about, among other things, pollution and sustainability on the island. One of the conclusions is that water treatment plants should have a high priority. According to Brouwer, once there were 20 million guilders reserved for the installations, but those funds are still not there. "This is urgent: there must be a solution." The meeting was attended by policy officers and NGOs who would have an interest in the conference. In addition to the discharge of wastewater into the sea, attention was also paid to homes that are self-sufficient and protection of the sea by marking the waters around the island as protected areas.